Nextt Golf operates with the mission of providing high end performance at low end prices. With a cost point that rivals or beats many competitor sets, the Nextt Golf Z One 14 pc Women’s Pkg Set brings performance and affordability to new and improving golfers. This women’s set includes a total of 14 pieces, including two woods, one hybrid, six irons, putter, stand bag, and three headcovers. Each piece is made with an Exile MDC Graphite by Apollo and an exclusive Perfect Feel Micro Traction Grip. Altogether, the set uses advanced technology like perimeter weighting, quad channels, wide soles, and large sweetspots. Nextt Golf introduces its full set designed especially with women: the Nextt Golf Z One 14 pc Women’s Pkg Set. With a full set of clubs, matching headcovers, and golf stand bag, the set offers a combination of value and quality. 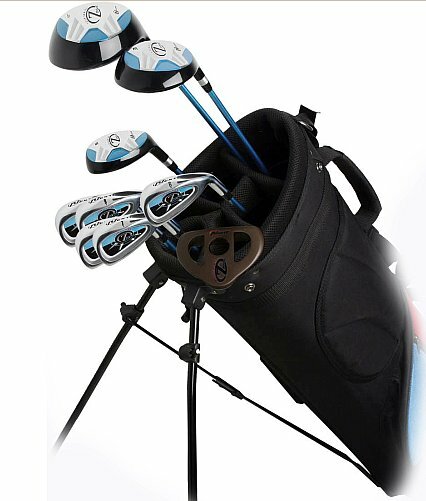 The ten-club set, along with three matching headcovers, fits easily in the Nextt golf stand bag. Women found that the Nextt Golf has delivered quality, performance, and affordability in the Nextt Golf Z One 14 pc Women’s Pkg Set. With a solid feel and comfortable grip, this set features a diverse range of clubs to hit every part of the course.